As the holidays near and our homes fill with hope and excitement, it is important to remember that many potential hazards face our furry friends. Some of the hazards are more dangerous than others and some more obvious than others. Many a curious feline and the occasional puppy find the electric cords to be fascinating toys. The problem that can occur is when the Christmas lights are on and those sharp teeth pierce into the wires. Electrocution may only cause minor burns to the tissues -usually of the mouth. However, it may cause more serious conditions such as fluid accumulaiton in the lungs or abnormal rhythms in the heart. A few ways to help prevent electric shock from occuring are to remove all tags from cords, try to prevent dangling of cords and consider elminating lights if your pet is too interested in them. If the lights are necessary be sure that pets are well-supervised while they are lit. The holidays usually see the arrival of foreign body (FB) ingestion. Unfortunately the throat, stomach and intestines usually do react favorably to these objects. Tinsel is among the culprits of which to be mindful. This along with other types of stringy toys, ribbons and decorations can cause “string gut”. String gut is when a string or string-type object is ingested by a pet. It often will cause vomiting, diarrhea, inappetance and lethargy. If these are seen and your cat or less commonly – your dog is suspected of ingesting such an object, a visit to your veterinarian is strongly advised. A thorough physcial examination and abdominal xrays would be warranted to assess the condition. Unfortunately with string-type FBs, a part of the string will often lodge in one spot. The rest of the string moves through the intestines and can act like a saw and actually cut through the wall. Other FB ingestion often occurs around the holidays as pets are interested in newly unwrapped items in the house. The best method of prevention is to keep all potentially hazardous objects out of reach. This includes tinsel, ribbons and bows, small toys, candy wrappers…. As the owner of a very curious feline, an unsupervised moment led to the ingestion of the string that had just been removed from the turkey. This was the cause of much distress for everyone, especially Felix, who luckily passed the string with the aid of laxatives and rehydration. If your pet should be one of the lucky ones that “passes” the string – please remember that pulling at the offending object as is moves out of your pet can cause much damage. Just cut it carefully and monitor closely. Unfortunately, not all pets are so lucky and require intensive medical and sometimes surgical intervention. Then there is the holiday food itself. Oh how tempting it all is…. chocolates, turkey, bones, fat…… It is best to stick with Fido’s usual diet to prevent the upset that comes from dietary change. All bones can potentially cause inflammation in the stomach and intestines and may splinter and cause perforation. A high fat intake may reak havoc on the pancreas – the organ that is responsible for the production of digestive enzymes. Pancreatic inflammation (pancreatitis) can cause severe illness in animals. Last but not least heavenly chocolate that surrounds us during the holidays, often mistaken by dogs and cats as a great treat. Chocolate contains theobromine and caffeine. Different types of chocolate contain different amounts each – theobromine is the predominant toxic component with caffeine usually in much lower concentration. The concentration of theobromine is present in increasing concentration in chocolate as follows: white, milk, dark (sweet), semi-sweet chips, baker’s (unsweetened), cocoa beans, cocoa powder. If your pet ingests chocolate – contact your veterinarian. Chocolate can not only cause GI upset and increased heart rate but has much more serious effects on the nervous system and can lead to tremors or seizures. A calculation of the thoebromine ingested will be made based on the product and amount eaten. This will help to determine is a visit to clinic is needed. If dangerous levels have been eaten, vomiting may be induced and activated charcoal may be given to bind the toxin. Intavenous fluids may also be necessary to increase urination to prevent the reabsorption of caffeine from the bladder. Holiday plants can also be a risk factor – while poinsetta has long been thought of as poisonous – its main effect is mechanical irritation of the stomach leading to vomiting. Less innocent are mistletoe; holly and ivy should be kept out of reach. Remember that during this busy season – pet-proofing your home is super important. 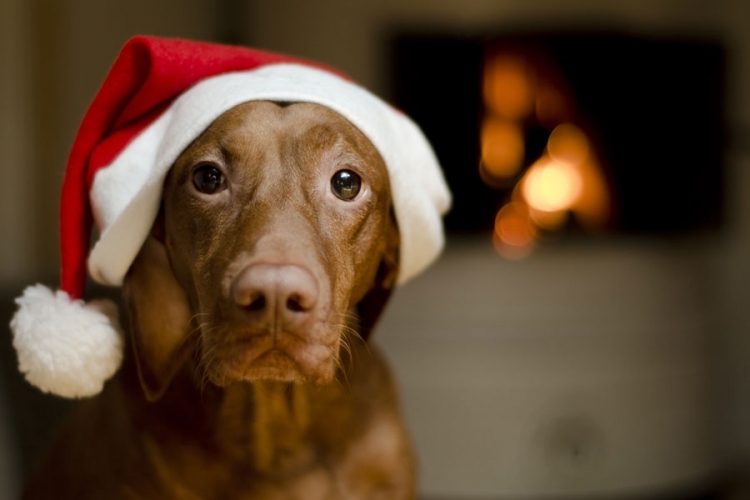 Wishing you a safe and happy holiday season – from all of us at Vetcetera Animal Hospital !